A web log on condensed matter (usually semiconductor nanostructure) physics from a theorist's perspective. What constitutes a "semiconductor" can be a complicated question when you really dig into it. Indeed, a large chunk if not most of the first class I took dedicated to semiconductor physics was reserved for this. As such, this post won't be nearly as in-depth as that, but instead focus on one vital aspect of semiconductors: their "band gap." To get there, however, I must first introduce a new concept: the Fermi energy, E_F ("E subscript F"). The concept behind the Fermi energy is simple. Because two electrons cannot be in the same state at the same time (the famed Pauli exclusion principle), as you add more electrons to the system, they must occupy higher- and higher-energy states. (With the introduction of spin, two spins can be in the same spatial state as long as they have the opposite spin.) The Fermi energy is, then, simply the energy of the highest-occupied state when all of the electrons are in their lowest-energy state. At zero temperature, all of the states lower in energy than the Fermi energy will be occupied, while all of the states above the Fermi energy will be empty. Now, if there are multiple states at the same energy ("degenerate" states in the parlance), they will each get occupied before higher-energy states, but this doesn't affect the definition of the Fermi energy; it's just as described above. An illustration of the Fermi energy at 0K is below. Now for the band gap and how it relates to semiconductors. A special property of semiconductors is that they have a band gap. That is, there is a continuum of states up to a certain energy (the valence band) and at above an energy above this (the conduction band). This is complicated to explain in text; the illustration below is much more straightforward. 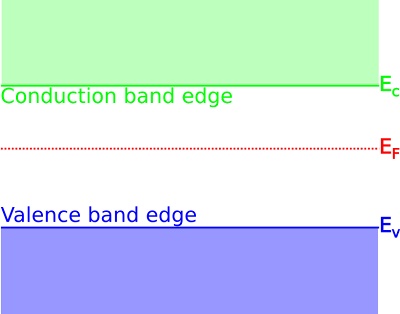 Above the conduction band edge (green above), there are allowed electron states (translucent green). 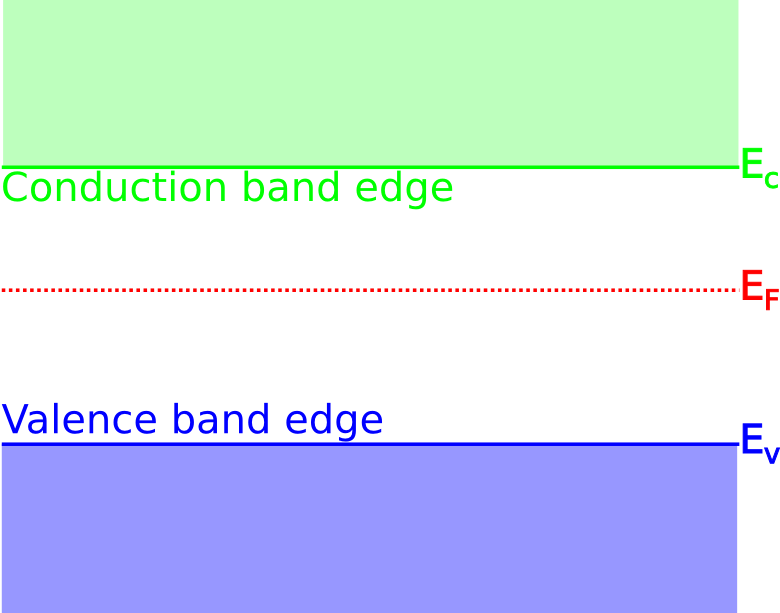 Below the valence band edge (blue below), there are allowed electron states (translucent blue). 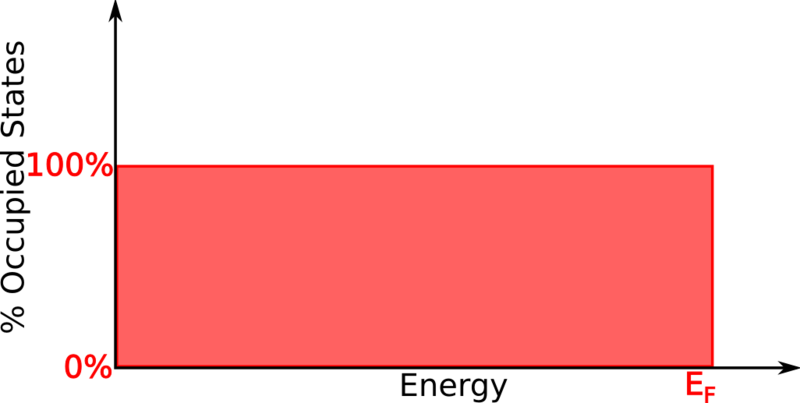 The white area in the middle is a forbidden region, the band gap. How wide this gap is varies from material to material. In InSb, for example, it's quite small (0.235eV ) while in diamond it is quite large (5.48eV ). You may notice the Fermi energy in there. If the Fermi energy were above or below the bandgap, there'd be free states and electrons readily available. Since it's in the bandgap, however, it takes an initial energy investment to get an electron into a free state. Since the band gap can be seen as a forbidden region and is dependent upon the material chosen, one may choose a structure composed of a set of materials carefully in order to do useful things. These nanostructures will be the topic of the next blog posting. I. Vurgaftman, J. R. Meyer, and L. R. Ram-Mohan, Journal of Applied Physics 89, 5831. I am a postdoctoral researcher at the University of Oklahoma. I'm working with the experimentalists on investigating the Rashba spin-orbit effect in InSb InAlSb quantum wells. In addition, I work with experimentalists at the University of Arkansas on electrons in CdS/CdSe/CdS quantum well quantum dots (QWQD). What this work entails requires an involved explanation, and will be the subject of initial blog postings.